Schaeffer is an idiosyncratic figure. He first made his name as a critic, theorist and author of two milestones in Polish publishing: New Music: Problems of Contemporary Compositional Technique and A Little Guide to Twentieth-Century Music, both published in 1958. Schaeffer had assimilated an astonishing range of information, both technical and interpretative, and these and subsequent books, often liberally illustrated with musical examples, provided a primary source for most Polish musicians, even if, at times, they were overly polemical or factually unreliable. He did not emerge publicly as a composer until 1960, by which time he had, by his own count, written a large number of ground-breaking pieces. His Music for Strings: Nocturne (1953), which he has claimed as the first Polish (post-war) twelve-not piece, has had a shadowy public presence (it was not premiered until 1961) and no discernible impact. Its row is constructed as the simplest all-interval sequence, expanding stepwise either side of the initial pitch class. Nocturne‘s motivic and imitative antecedents are closer to Bartók than any Viennese example, but it remains a rusher lumpen experiment. Schaeffer subsequently wrote a large number of piano pieces that have the air of technical exercises. Some of them – Study in Diagram (1956), Free Composition (1958), Linear Construction (1959) – show early evidence of Schaeffer’s fascination with the role of notation as a mechanism for shaping or visually schematising compositional and performance practice; the twelve-note basis of these pieces is almost incidental to rapidly developing concepts of notational practice. Permutations for ten instruments (1956) is cat in pointillistic mode, though the score of the last movement is conceived in a type of space-time notation. Although few composers moved without a backward glance from the old towards the new, there could not be a stronger nor more puzzling contrast tun when the neo-classicism of Quattro movimenti (1957) is set against Extremes (1957, published in 1962), in which conventional signs and symbols (pitch class, staves, metres) are totally replaced by new codes of conduct which seem to constrict rather than to liberate. Schaeffer’s didactic frame of mind was emphasised in Tertium datur (1958), the work with which he made his public debut at the 1960 ‘Warsaw Autumn’. Subtitled ‘A Composer’s Treatise for Harpsichord and Instruments’, it mixes conventional and graphic notation and conventional and experimental musical gestures. For the set of nine variations of the second movement, Schaeffer provides a diagrammatic plan; in each variation, there are eight ‘phrases’ (A-H), each made of rotations of one-, two-, three- and four-crotchet ‘bars’. The instrumental ensemble is conventionally notated and functions as a cushion for the solo harpsichord. The notation of the solo part ranges from the totally specific to the speculative. At this stage, Schaeffer had not yet mastered the difficult task of transferring sufficient input to the players to warrant his notational trials. There was, however, a considerable loosening of the pitch organisation into more flexible tropes and interval envelopes. Nevertheless, the schematic still controlled the intuitive. Bogusław Schaeffer is the most iconoclastic figure in post-war Polish music. In the 1960s he drew on elements of sonorism but also on many other contemporary sources. A trenchant opponent of artistic conservatism and a restless advocate of the avant-garde principles of the 1950s and 1960s – from Western European serialism to merican performer-controlled aleatorism – he has created an enormous body of work marked by the spirit of ceaseless experimentation rather than any consistency of style or language. Already in 1960, the year of his public debut as a composer, there is ample evidence of the dynamism of his eclecticism and ‘the preponderance of problems of technique over those of expression’ [Schaeffer, preface to the score of Equivalenze sonore, his ‘second compositional treatise’, 1959]. This is symbolised by the third of Schaeffer’s ‘compositional treatises’, Montaggio for four pianists and percussionists (1960). Against a schematic grid, each instrument plays a defined sequence of thirty four-second blocks of material. To this Schaeffer adds layers of stylistic counterpoint: ‘a virtuoso piano, a strict piano, an aleatory piano and a percussion piano […] This results in […] various structures and various styles of interpretation […] the composition is an attempt at a new formal system within strict set limits’ [Schaeffer, preface to the score of Montaggio, 1960]. 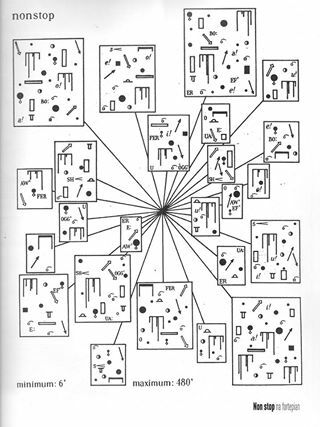 A more complex version of this principle lies behind Topofonica (1960), in which forty solo instruments perform sequences of small motivic fragments in a mosaic which is both highly structured (a ‘passacaglia of instrumental timbres’ [Jadwiga Hodor, ‘Warsaw Autumn book, 1989, p.199]) and open to certain interpretative variables (e.g., four pages use three different ink colours to mark out alternative instrumental combinations). Its heterogeneous sound world is still controlled by intellectual rather than timbral pursuits. In complete contrast, the multiple polyphonies and unconventional performance techniques in the five short movements of the orchestral Little Symphony: Scultura (1960) reveal a composer fully capable of using mass sound shapes to create a coherent expressive argument which stands comparison with contemporaneous pieces by Ligeti, Xenakis and Penderecki. Were Schaeffer concerned with a personal musical identity, such shifts would seem illogical or inappropriate. Instead he wanted to examine composition as an activity to be pursued for its own ends. Furthermore, he did not regard himself always as the prime figure in the process, though the difference between Schaeffer as puppet-master and as disinterested man of ideas is not always self-evident. In fact, Schaeffer was the first Polish composer to devolve substantial compositional responsibility to the performer, and he was able to do this not least because of his voracious appetite for new notational procedures. The best-known example is the one-page graphic mobile, Nonstop (1960), whose realisation may last anything from six minutes to eight hours. Structurally and notationally, it foreshadows a number of pieces, including the stage composition TIS MW2 (1963), Two Pieces for violin and piano (1964) and Quartet 2+2 (1965), whose duration may be anything between four minutes and four hours. With a typically wry twist, Nonstop‘s notation includes syllables from his own name. 1. Sounds should be constantly varied; repetition of sounds should be avoided. 2. For each repetition of an element with the same symbol there should be a different rhythmic, dynamic and articulatory response. 3. The performer must try – as far as possible – to link small elements together into larger groupings (e.g., left-hand glissando + right-hand chord + whistling + foot-stamping = ‘a motif’. The performer of the piece must be male with a baritone voice; when the piece’s duration is prolonged, between 3 and 8 pianists may take it in turns [Schaeffer, Musica per pianoforte (Kraków: PWM, 1964), p.10]. The premiere by [Zygmunt] Krauze and John Tilbury, designed by the composer and with the participation, among others, of the avant-garde visual artist and founder of the experimental Cricot Theatre in Kraków, Tadeusz Kantor, did not take place until 27 October 1964. It lasted for seven hours thirty-eight minutes and is often cited as the first Polish musical happening [Joanna Zając, Muzyka, teatr i filozofia Bogusława Schaeffera. Trzy Rozmowy (Salzburg: Collsch, 1992), p.12]. The link with Kantor was a significant symbol of Schaeffer’s developing aesthetic. Kantor’s search for what in 1956 he had called ‘autonomous theatre’ and his belief that’ what is important about theatre is the process rather than the product’ [Kathleen M. Cioffi, Alternative Theatre in Poland 1954-1989 (Amsterdam: Harwood, 1996), p.46] found enormous resonance in Schaeffer’s output. After 1960, Schaeffer continued to provoke the musical establishment. He published polemical articles and books on contemporary music issues, including Classics of Dodecaphony (1964) and culminating in his mammoth Introduction to Composition (1976). His most notorious spat was in 1971 with the neo-classical composer and acerbic critic [Stefan] Kisielewski, but others too have seen Schaeffer as a charlatan, too prone to conceptual theorising and too unconcerned for the musical result. That is to misunderstand Schaeffer’s goals, which are always to challenge expectations and perceptions. And while he may overstate his case, there are many works which genuinely advance the boundaries of contemporary music. He was, for example, the only Polish composer [at that time] to explore the interface with jazz extensively (there are, of course, other isolated examples, such as [Włodzimierz] Kotoński’s Selection I for electric guitar, clarinet and alto and jazz saxophone, 1962, or [Kazimierz] Serocki’s Swinging Music, 1970]). In Course ‘j’ (1962), scored for woodwind, strings and percussion with a jazz sextet based on the line-up of the Modern Jazz Quartet, Schaeffer charts a path from his own environment (aleatoric, post-seril improvisation) via graphic notation towards a more conventional jazz idiom. Music for MI [the vibraphone player Jerzy Milian] (1963) is effectively a concerto whose central movement is for jazz sextet. But, rather than repeat the experiment of Course ‘j’, Schaeffer incorporates a solo soprano and six reciters who, at one stage in the explosive first movement, muse simultaneously on the nature of ‘melody’ and ‘word’. Elsewhere in the movement there is the performing instruction ‘continue until such time as the audience shows irritation’ and the pianist played excerpts from Schaeffer’s earlier solo piano piece, Articulations (1959). Such digressions and distractions are integral parts of his theatricality, and in the second movement of S’alto for alto saxophone and chamber orchestra (1963) members of the orchestra read out excerpts from Dostoyevsky’s The Possessed. While there are more conventional examples, such as Jazz Concerto for Orchestra (1969) or Blues I for two pianos and tape (1972), the jazz works of 1963 point irrevocably in the direction of theatre, and not just music theatre in the line of Kagel. Crucial to Schaeffer’s development at this juncture was the formation in his home city, Kraków, of the new music ensemble, MW2 (Młodzi Wykonawcy Muzyki Współczesnej – Young Performers of Contemporary Music). The core line-up of MW2 – two pianists, flute, cello, a dancer and three actors – was led by the pianist Adam Kaczyński, one of the foremost Polish exponents of new music. MW2 gave numerous Polish premieres of music by composers such as Cage, Bussotti, Castiglioni, Andriessen, La Monte Young and Pousseur. And while it performed music by a number of Polish composers, especially those like [Zbigniew] Bujarski, [Juliusz] Łuciuk, Krzysztof Meyer (b. 1943) and Marek Stachowski (b. 1936 [d. 2004]) who also lived in Kraków, its primary focus was on Schaeffer’s music, or, as he termed it, instrumental theatre. The first of a long line of ‘stage compositions’ was TIS MW2 for actor, mime, dancer, soprano, flute/violin, cello/alto saxophone, and two pianos, premiered in Kraków in April 1964 [TIS = Teatr Instrumentalny Schaeffera/Schaeffer’s Instrumental Theatre]. As one of its main axioms, TIS MW2 ranks the musical performance of musicians and non-musicians equally. It also attempts ‘absolute decomposition […] the ends of the composer are, above all, the non-schematism of the formal structure and the indefiniteness of this composition as a whole even for its performers’ [Schaeffer, preface to the score of TIS MW2]. Schaeffer provides a basic framework: the piece, lasting some thirty minutes, is performed in two parts, the first in almost complete darkness (just sufficient to make out the mime and dancer), the second in full light. The actor recites excerpts from a novel, Pałuba (The Hag, 1891-1903), by the Polish writer, Karol Irzykowski (whose life as critic as ell as author, and whose use of this novel to confront the pretensions and masks of established society, may be regarded as a precursor of Schaeffer’s own position and credo). The other seven performers are allowed to pick up on the text’s generalised opposites, such as the discrepancy between representation and reality, but may use only one phrase – ‘… for several years she had led a life full of phantom dreams’ – to guide their individual response to their sequence of sonic fragments. A series of stage compositions followed in quick succession, including Scenario for a Non-Existent but Possible Instrumental Actor (1963), Audiences I-V (1964), Quartet for Four Actors (1966), Fragment (1968) and Hommage à Irzykowski (1973). Added to these must be Howl for reciter, two actors and instrumental ensemble (1966), a setting of excerpts from Allen Ginsberg’s poem. Although there is a through-composed score, there is no notation of pitch, and other parameters are indicated only in general terms. More significant are the eight ‘idioms’ governing the actions of all the performers apart from the reciter: ‘chaos’, ‘anything’, ‘jazz’, ‘brutism-noises’, ‘action music’, ‘melodies’, ‘dull strokes’, ‘concentrating attention on oneself’. Given the nature of Ginsberg’s inflammatory poem – with its hallucinatory ode to New York drop-outs and excoriation of Moloch, a Canaanite idol to whom children were sacrificed – and Schaeffer’s colourful response, it is hardly surprising that this was one of the works to which Kisielewski took exception at its premiere (by an expanded MW2) in Warsaw in March 1971 [Kisielewski, ‘Schäffer – samobójca’ (Schaeffer – suicide) Ruch Muzyczny 15/9 (1 May 1971), pp.10-11]. Not only does he reveal, despite his post-war championing of creative freedom, his own inability to cope with the concept of happenings but he also demonstrates that the avant-garde progress of Polish music was subject to the checks and balances of public opinion. Quite a number of composers during our century have committed artistic suicide, for example Stockhausen, Boulez, Cardew […] so why shouldn’t Schaeffer be added to the list? After his recent manifestation at the Warsaw Philharmonic I set about conferring titles on him, e.g. : Schaeffer – the Dandy, Schaeffer – Conqueror of Americanism, Schaeffer – Spirit of the Age, Schaeffer – Pagan God of Narcotic Youth … and, saddest of all: SCHAEFFER – PRINCE OF SUPERFICIALITY. […] The author of Monosonata  told me recently that, if music has an inevitable tendency towards disintegration, it is necessary simply to accelerate that collapse. Congratulations, well done, if somebody is bent on being a grave-digger. […] Schaeffer wants to seduce these youngsters in a somewhat strange way, snobbishly, modishly, and in the ‘foreign fashion’ […] Howl, by the ‘rabid’ American Allan Ginsberg, – a rebellion against civilisation yelled out from the stage by psychedelics and drug addicts – is the latest Western fashion (Schaeffer envogue – quelle misère!) […] Howl was not very clever (or rather was mightily stupid) in its literal naturalism and vociferous expression: old jokes, rather unpleasant. Besides dragging on interminably, the naturalistic convention did not entirely seem to win over the youngsters brought up on television, so the success proved to be somewhat sickly (perhaps Schaeffer is already too old, too earnest for homegrown candidates for psychedelia?!) […] And so Schaeffer, destroying our sensitivity, achieves his commendable purpose of the inevitable hastening of the end of music. But what is the rush – he will perish with the music. Suicide! Schaeffer responded robustly, as was to be expected [Schaeffer, ‘Kisielewski – nożownik’ (Kisielewski – Cut-Throat) Ruch Muzyczny 15/13 (1 July 1971), pp.13-18], but he soon faced a creative impasse of sizeable proportions. He ‘disappeared’ compositionally in 1973 and emerged two years later. Musically, the result of this internal exile was the rather tame sonoristic idiom he adopted in the two orchestral ‘Harmonies and Counterpoints’: Warsaw Overture (1975) and, in a bizarre shift of creative emphasis, Romuald Traugutt (1976), a homage to the leader of the short-lived 11863 uprising against the Russian occupying forces. He gradually reasserted his old experimental will, as in another homage, this time to the master of conceptual art, Joseph Beuys (Voice, Noise, Beuys, Choice, 1984). And while Schaeffer has continued to create musical works, he has achieved greater fame and popularity both at home and abroad as the author of satirical and comic plays for the straight theatre. The very aspects of his work in the 1960s which so outraged audiences and critics by their perceived disrespect to musical traditions have led, since the early 1980s and especially in the 1990s, to a relaxed, humorous and broad-based appeal which lacks nothing in sophistication nor critical edge. The musical outsider found a home in the theatre.